Best Buy is helping customers get in shape for less with a limited-time sale on health and fitness products. 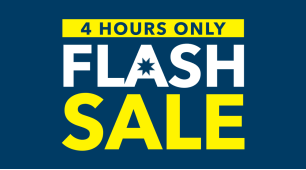 In a special 4-hour flash sale, the retailer is discounting a selection of activity trackers, headphones, DVDs and more products that’ll help you keep that New Year’s resolution of yours. Visit the store’s website to check out the full selection. This online-only sale event is valid from 9 a.m. until 1 p.m. Pacific time today (Jan. 5). Quantities are limited. For more tips on shopping at Best Buy, take a look at our Best Buy Store Guide and Best Buy Sales and Events Guide.